Five days before Passover, minds and bodies bend to the approaching festival: ritual cleaning, massive food shopping, gargantuan feats of cooking. In Israel, this seven-day holiday is followed in quick succession by the Mimouna (a North African Jewish holiday that has been adopted by nearly all the country’s ethnic groups), Holocaust Martyrs and Heroes Remembrance Day, Memorial Day for Israel’s Fallen and Victims of Terror, and Independence Day. Hardly a shortage of festivals and days of national solidarity. But for some, these are just not enough. Last week, a visitor to the West Bank could witness a Jewish-nationalist holiday in the making. The site is Qasr al-Yahud, the part of the Jordan River near Jericho where tradition says Jesus was baptized by John the Baptist (Matthew: 3:13-17). At this very site to which Jewish tradition also lays claim, several miraculous events took place. On the tenth day of Nisan, that is, five days before Passover Eve, the waters of the Jordan parted miraculously to allow the Children of Israel to enter the Promised Land (Joshua 3: 14–17). And it was here that the waters parted so that the prophets Elijah and Elisha could cross on dry land, before Elijah ascended to heaven in a fiery chariot (2 Kings 2: 6–10). Like so many religious sites in the Holy Land, this one belongs to the Greek Orthodox Church, but monasteries and churches of various denominations dot the landscape. Israel administers the site under its Parks and Nature Authority, with a shop that sells bottled Jordan water and white gowns for those who want to follow in the footsteps of Jesus and be baptized in the river. The border between the Israeli-controlled West Bank and Jordan runs through the middle of the river; Israeli soldiers provide security on the western side while their Jordanian counterparts patrol the eastern side, and on both sides busloads of pilgrims arrive in a steady stream. Israeli sources say there were 750,000 visitors last year on the Israeli-controlled side and that they look forward to having 2 million visitors annually in the future. According to one source, the name of the site, Qasr al-Yahud (in Arabic, Palace of the Jews) derives from a name given to the Church of John the Baptist there because of its splendor. Another explanation is that this name is a corruption of the Arabic Kasser, meaning “breaking,” a reference to the parting of the waters for the crossing of the Children of Israel. Maj.-Gen. (res) Uzi Dayan, now a Likud member of Knesset, and his like-minded friends take credit for organizing the celebration of a Jewish/national holiday at Qasr al-Yahud. This year they brought in 17 busloads of Jews from all over the country to mark the tenth of Nisan, with an emphasis (repeated many times) on the land that God gave the Children of Israel, repeated especially by the keynote speaker, former Ashkenazi chief rabbi of Israel, Israel Meir Lau. Next year Dayan’s group plans to bring more. There was no explanation of where the money for the buses came from. The busloads also visited nearby Jericho—which Israel has closed to its citizens except for this one day a year—to see the mosaic floor of a seventh–eighth-century CE synagogue and to see the walls that came tumbling down (accompanied by an ingenious explanation of the location of those walls—which most archaeologists agree have never been found). Jericho is considered a “quiet” West Bank town, but this incursion did not sit well with all the residents. As we were leaving, a few children flung stones at our armored bus, hard enough to damage one of the windows. Perhaps that was proof, if any more was needed for this audience, that Israel should annex the West Bank. My visit to Qasr al-Yahud and Jericho was provided by the Government Press Office. Text copyright 2019 by Esther Hecht. No part of the text may be used without written permission of the author. A headline in yesterday’s paper brought tears to my eyes, but the more I thought about it, the proper response seemed anger. The news was that Israel’s Health Ministry now requires hospitals to remove a fetus from a woman’s womb within 72 hours after it is diagnosed as dead. Moreover the dead fetus must be buried within 10 days. Hospitals must also provide psychosocial services to the parents during this difficult time. I was appalled at the thought of women being forced to continue carrying a dead fetus for up to several weeks because the medical establishment did not consider their situation medically urgent. I felt deep sorrow for the women. It took a while, but then I felt the anger. Where was the Health Ministry until now? Is it perhaps because it is run by men, and hospitals are run by men, that they could ignore the suffering and the horror? Cousin Gus once wrote to me that someday he would tell me the story of how my parents and older brother were able to escape from Belgium to the United States in 1940. Gus was 84 when he wrote to me. But though he lived to be 100, he never followed through on his promise. He had, however, fulfilled a much greater promise in his lifetime: to get my parents and brother out of Antwerp and safely on a ship headed for the United States. And this week, Gus’s son Lewis told me what he knew of the story. My parents were living in Vienna when the Germans invaded in March 1938. Like many other Jews, they had good reasons for staying and hoping for the best. My mother was six months pregnant; precarious travel was out of the question. But my father was arrested on November 9, 1938—Kristallnacht (known in English as the Night of Broken Glass)—a pogrom against Jews throughout Germany and German-held areas. He would have been deported to a concentration camp had not a guard let him escape in exchange for a gold watch. Unable to return home, my father hid in the home of a non-Jewish employee of my grandfather. And as soon as he could, he fled Vienna, making the exhausting trip on foot to Antwerp, which was still free. My mother and three-month-old brother remained behind. Eventually, my mother received false papers provided by British Quakers, enabling her and my brother to travel to Antwerp and join my father. There my parents wrote to all their relatives in the United States, asking them to provide an affidavit, the document without which they would not be admitted to the country. They waited in Antwerp for more than a year. At last, it was cousin Gus who came through for them. I still have two copies of the original affidavit. They show that Gus worked in the film industry, had a very good salary, and owned two cars. If necessary, he could support them and they would not be a burden on the state. But an affidavit was not enough. Everyone was trying to get out, and my parents’ papers were low in the pile of requests. And this is approximately what Lewis told me this week: Gus knew an executive in Columbia Pictures who was in Antwerp, and he knew the U.S. ambassador, and the ambassador knew another diplomat. Gus asked the film executive for a favor, the executive asked the ambassador, and the ambassador asked the diplomat. And so, through this chain of favors, my parents’ papers were moved up in the pile. My parents’ names appear on the passenger manifest of the S.S. Pennland dated March 21, 1940, as does the name of my brother, already then anglicized to Harry. The Pennland was the last passenger ship to leave Antwerp before the Germans overran Belgium. Had my parents not been on it, they and my brother might have been murdered by the Germans and their henchmen, as were nearly all the members of my father’s family. I would not have been born. One of Jerusalem’s best offerings—the free Monday afternoon Ethnachta series of chamber music concerts—is yet again in danger of being axed. The series was born in 1983 when the Israel Broadcasting Authority established Kol Hamusika (the voice of music), Israel’s classical music station that broadcast the concerts live. The featured artists include promising young Israeli musicians and older Israelis who have already established vigorous careers in Israel and abroad as well as artists from other countries. And the music is not all Beethoven and Brahms. Etnachta also features works by Israeli composers. Since 1989 the concerts have been produced and presented by Hayuta Dvir, who introduces each musician and each work with both passion and erudition. On Monday afternoons, even in stormy weather, hundreds of local residents and visitors can be seen streaming to the Henry Crown Symphony Hall at the Jerusalem Theater, often filling the venue to the rafters. Last Monday, although there was no listing or announcement of the concert and though it wasn’t at all certain that it would be possible to get past the roadblocks set up for the visit of President Donald Trump (Dvir came to the concert hall on foot while the roads were still closed off), the loyal audience turned out en masse to hear the Israel Haydn Quartet. The group—Eyal Kless (piano), Svetlana Simanovsky (violin), Tali Kravitz (viola), and Shira Mani (cello)—played a lush program of Puccini, Mozart, and Brahms and was joined by clarinetist Eli Even for one of the works. I sat close enough to watch Mani’s often facial expressions as she wielded her bow. She seemed enraptured, and that added to the pleasure of the sublime music. But whereas previously listeners at home could have tuned in to their radios or streamed the concert on their computers, this time—ominously—the music was not broadcast live (though Dvir managed to organize a recording). And when the final applause came to an end, Dvir told the audience that the next concert, scheduled for June 19, would be the last…unless the public used its power to influence the new broadcasting corporation, which has already wreaked havoc in the lives of so many journalists and technicians. So please let the corporation know that the public wants the Etnachta concerts to continue. And I would add that I would like them to continue with Hayuta Dvir, who is their heart and soul. Here is an e-mail address: info@ipbc.org.il, and here is a phone number: 072-390-5555. In 1800, an opera singer in Rome is duped into believing she has been betrayed by her lover, a painter who is hiding a political prisoner on the run from the police. All come to a bad end. That, in a nano-nutshell, is the story of Puccini’s Tosca, the highlight of the fifth Opera Festival at Masada, opening this Thursday. 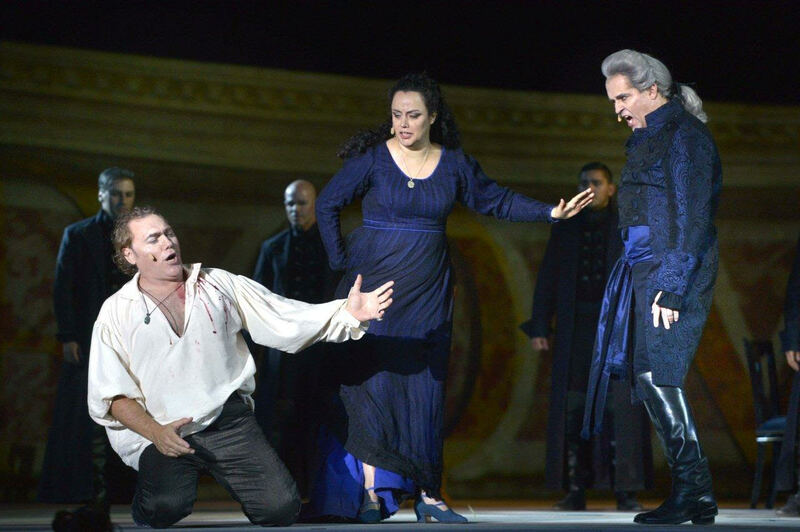 At first glance there seems to be no Jewish angle to this opera—except, of course, the venue, the Israeli Opera performers, the Israel Symphony Orchestra Rishon LeZion, and conductor Daniel Oren, not to mention the huge production crew. But seek and ye shall find. After Hadrian, his family, and other emperors were buried in the tomb, it had many uses. At the time in which the opera is set, it was a papal prison, undoubtedly a place of terror for the persecuted Jews of Rome. The opera’s action takes place on a single day—June 14, 1800—during the Napoleonic wars. On this day, Napoleon’s army battled the Austrians in Marengo, in northwestern Italy. In Act One, news arrives that the Austrians have routed Napoleon’s forces. But in Act Two, a very different outcome is announced: The Austrians have been defeated. What Napoleon’s victory meant for the Jews of Italy, and Jews throughout the European areas under his control, was a respite, albeit brief, from persecution. Act One, which is set in the church of church of Sant’Andrea della Valle, ends with the singing of a Te Deum (a hymn of praise), celebrating the apparent Austrian victory. In the Masada production the singers include the Moran children’s chorus and the Israeli Opera chorus, dressed as nuns and priests. But anyone who looks closely can see that some of the “priests” are wearing T-shaped, “kosher” crosses. “It’s a known ‘patent’ [trick] in Israel” to accommodate religiously observant performers, explained Michael Ajzenstadt, the artistic administrator of the Israeli Opera, at a dress rehearsal this week. That final scene of Act One, in which several large crosses are displayed and black-clothed figures prostrate themselves on the stage, made at least one observer uncomfortable. “It reminds me of the Inquisition,” she said. That, of course, led to the question of the performance of Carmina Burana, the second fully staged work that is part of this year’s Opera Festival at Masada. This work, by German composer Carl Orff (1895–1982), was very popular in Nazi Germany, and his relations with the Nazi regime are the subject of debate. •	While Italy was undergoing political and cultural unification, the press initially portrayed Puccini as the ideal Italian composer and the ideal Italian man, but then, when his operas failed to support this view, attacked him as a polyglot, a traitor, a Jew. •	Puccini’s opera is based on a five-act play, La Tosca, by the French playwright Victorien Sardou. Sarah Bernhardt played the title role in the 1887 premiere and then toured the world in that role. •	The Canadian-Jewish baritone George London (born George Burnstein in 1920) sang the role of the sadistic police chief Scarpia opposite Maria Callas in 1956. •	Cantor and opera singer Jan Peerce, born Jacob Pinchas Perelmuth, sang the part of Tosca’s lover, Cavaradossi, with the Metropolitan Opera of New York in the early 1940s. •	Australian bass Joshua Bloom sang the role of Angelotti, the escaped political prisoner, with the Los Angeles Opera in 2013. •	Dmitri Jurowski, 35, who comes from a family of Russian-Jewish musicians, conducts the Moscow City Symphony Orchestra and has led the Bolshoi Opera. He made his US podium debut in Chicago, on January 14 this year, with Tosca. •	The German-Jewish novelist and playwright Lion Feuchtwanger, author of the 1925 novel Jud Süß (Jew Suss, published in English translation as Power) had this to say about the Nazi film industry’s adaptation of it: “By adding a touch of Tosca you have transformed my novel, Power, into a vile anti-Semitic movie à la Streicher and his Sturmer.” Feuchtwanger was referring to a scene in which Dorothea comes to Suss to plead for her husband’s life, just as Tosca comes to police chief Scarpia, only to hear his cries as he is tortured. •	The following item was sent out by the Jewish Telegraphic Agency on March 29, 1937: “Principals of the Jewish School of Music in Pinsk face court proceedings because students sang in Yiddish the first act of Puccini’s opera ‘Tosca’ which takes place in a Catholic convent, according to a press announcement. •	John Bell’s production of Tosca at the Sydney Opera House in January 2015 sets the events in 1943 Nazi-occupied Rome. A shepherd boy wears a yellow star, and in the final prison scene the audience realizes that the group of people sleeping outdoors are Jews in transit to an extermination camp. When this production opened a month earlier in Melbourne, chorister Sitiveni Talei was visibly shaken by having to give the Nazi salute. He is the son of a Jewish mother and a Fijian father and learned he was Jewish only at the age of 16. Text copyright 2015 by Esther Hecht. No part of the text may be used without written permission of the author. Photo courtesy of the Israeli Opera. The 27th Jerusalem International Book Fair kicked off today with a press conference with writer Ismail Kadare. The Albanian novelist and poet is to receive a prize awarded annually to authors whose work emphasizes freedom of the individual in society. Previous recipients have included Arthur Miller and Ian McEwan. Kadare now lives in France. I have wanted to read his novels ever since I learned about him while researching a travel article on Albania in 2011. My desire to read him was heightened after driving over an excruciatingly potholed road to visit Gjirokaster, the hometown of the author and also of Enver Hoxha, the longtime Communist dictator of Albania. Despite my best intentions, however, that hasn’t happened yet, and I don’t think it happened to most of my colleagues at the press conference. None of us came up with a question that didn’t seem to bore or annoy the acclaimed author. In response to the inevitable question as to whether Jews and Albanians have anything in common, Kadare responded that they both live with the threat of extinction, although one cannot really compare the fate of the two. “I don’t think there is any country that has banned the writing of a language,” Kadare said. For the four centuries that Albania was part of the Ottoman Empire, writing in that language was forbidden. The language “was at risk of extinction” and thus the people feared that they, too, might disappear, he said. This year’s book fair differs from its predecessors both in its new venue—the First Station, one of the city’s newest entertainment areas—and its expanded program. According to Yael Sheffer, the fair’s artistic director, the five-day event is geared to young adults and young families. There will be cooking classes in the mornings, activities for children in the afternoons, and a full program for adults, including erotica and poetry, in the evenings. And as for Kadare, who appeared relieved to be liberated from the press conference, I thought of D.H. Lawrence’s caveat to trust the tale, not the teller. More than ever, I wanted to read Kadare’s novels and erase the disappointment with this unfortunate meeting. Text copyright 2015 by Esther Hecht. No part of the text may be used without written permission of the author.